What in the World is Brainspotting? It’s widely agreed that unresolved trauma affects our nervous systems and contributes to depression, anxiety, PTSD, and many of the other challenges that lead young people to seek treatment in programs such as Dragonfly Transitions. 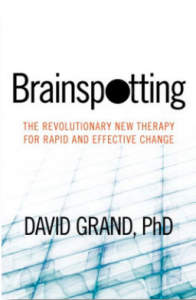 Therapeutic techniques such as Brainspotting (a brain science based technique developed in the mid-1990s) and EMDR (short for “Eye Movement Desensitization and Reprocessing”) promote processing and resolving traumatic experiences. As I’m using it here, “trauma” is any deeply distressing experience; in other words, it’s something we all experience from time to time. Here’s how the Dragonfly team came to be trained in this exotic-sounding therapy. In May, I and three of my colleagues, Mona Treadway, PhD (Co-founder of Dragonfly), Jennifer Patzke, MA, LPC (Clinical Director), and Casey Sims, MSW, CSWA (Primary Therapist) joined 12 other therapists at Calo in Lake of the Ozarks, Missouri to participate in a three-day intensive training on “Brainspotting” led by Steve Sawyer, a founder of New Vision Wilderness Therapy, and one of a handful of Brainspotting trainers in this country. She “tracked my fingers…across her visual field….After about a minute, just as my fingers crossed the midline of her nose, her eyes wobbled dramatically and then locked in place. My hand locked with it. It felt like someone had grabbed my wrist and held it in place! For the next ten minutes, Karen’s eyes remained locked on my unmoving fingers. She watched and reported on a flood of images and body sensations that seemed to come out of nowhere. She watched, wide-eyed, as traumas that had not emerged during her years of intensive therapy now came up and whizzed by” (Grand, 2013, p. 13). For three days, we immersed ourselves in the theory and practice of Brainspotting. We were given pointers that we learned to use to guide the client’s eyes until they arrive at the “spot” or spots where they experience maximum activation of emotion. We then kept the pointer at this spot, asked the client to fix their gaze there, and “silently held the space” while they processed their experience. By the end of this processing, most clients report a significant decrease in the distress associated with the emotion. One of the hard parts for us trainees was remaining silent—even head nods and the common therapeutic “uh huh” are discouraged. This is hard because therapists are trained to show their clients that they’re paying attention. In fact, Brainspotters are no less attuned, but they are silent witnesses of the client’s process. It took some practice (and much friendly haranguing from Steve) before most of us could do it consistently in our practice sessions with each other. Back in Oregon, Jennifer, Casey and I have used Brainspotting with clients and will be sharing what we’ve learned with our Clinical team. While it’s still early yet, the results are encouraging. We have been impressed by how helpful it can be, not least for students who overly attend to their therapist and take their cues from how we’re responding to them. For these students, Brainspotting frees them to stay focused on whatever thoughts and feelings come up, while having us present to guide, listen, and support them.